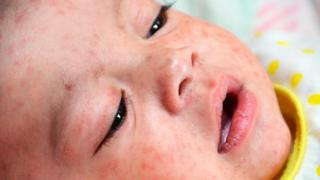 Parents are being urged to ensure their children have both MMR vaccinations as a measles outbreak has been confirmed. Fourteen people have caught the highly infectious virus in the Cardiff and Blaenau Gwent areas of south Wales. The latest outbreak follows one in Newport and Torfaen in 2017 and another spate earlier this month. School children and young adults are advised to get protected before going away on their Easter holidays or attending half-term play schemes. "Ahead of the Easter break we are urging all parents with children within the Cardiff and Blaenau Gwent areas that have not had two doses of MMR to contact their GPs and immediately arrange this quick, safe and effective vaccine," said Dr Gwen Lowe of Public Health Wales (PHW). "This is particularly important before unvaccinated and unprotected children mix with others in play schemes and play settings over the holiday period. "Similarly we're appealing to young adults from the Cardiff and Blaenau Gwent areas to get up-to-date with their MMR vaccinations before going on holiday to Europe, where a number of measles outbreaks are ongoing." PHW has written to schools, colleges and universities in the affected areas about the risk. It has also asked local health boards to consider undertaking vaccination sessions in schools. Adults who have never had measles or the MMR vaccine and who work in close contact with children have been urged by PHW to speak to their GP about vaccination. Public Health Wales said measles is "very contagious" and can cause serious complications and in rare cases can be fatal. It said anyone showing early signs of the virus - the symptoms of which include fever, cough, runny nose and red eyes - should not go to places of work or school and should avoid social interactions. The World Health Organisation declared that the UK had "eliminated measles" for first time in 2017.